Last week we shared the results of our Feeling Happy drawing competition. 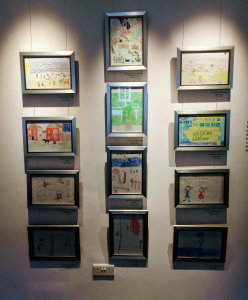 We’re delighted to say that the drawings are now on display at Amersham Museum alongside the Amersham Toys exhibition. The exhibition runs until 2nd September 2018. After that, we hope to secure space at other local venues to display the pictures.